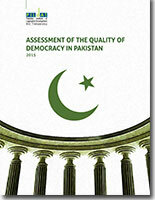 This is Urdu Version of "Assessment of the Quality of Democracy in Pakistan 2015"
This is Urdu version of Report on "Assessment of the Quality of Democracy in Pakistan, June 2013 to December 2014". 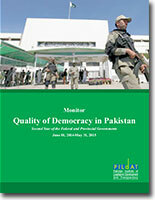 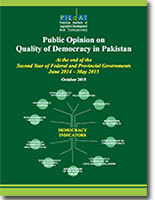 With the objective to inform and engage citizens to monitor performance of democracy, PILDAT began publishing a succinct analysis on the performance of democracy using an indigenous framework that analysed key institutions of democracy including elected Executive, Legislatures, Judiciary, Political Parties, Civil Society and Media since 2002. 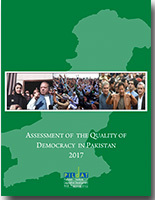 Over the years PILDAT refined the framework by learning from regional and international good practices to provide an assessment of democracy that is relevant and centred to the peculiarities of democracy in Pakistan. 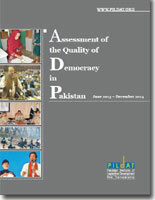 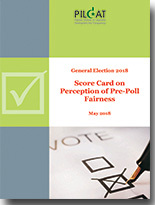 With the belief that quality of democracy in Pakistan must also be comparatively analysed and scored, PILDAT has also adopted using the framework developed by International Institute of Democracy and Electoral Assistance (I-IDEA) to provide an internationally comparative score card to assess quality of democracy in Pakistan. 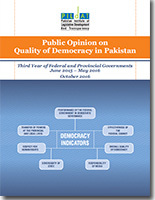 Quality of democracy is periodically gauged by PILDAT using two methodologies: public opinion polls that gather citizens’ perspectives on various aspects of quality of democracy as well as an analysis and score card based on research. 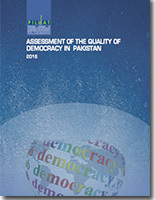 PILDAT’s periodic assessments of quality of democracy are guided by the belief that objective analyses of quality of democracy in Pakistan must offer proposals for democratic reform that can strengthen democracy and democratic institutions.